Use Victorian button-up boots as vases for dried flower arrangements; put a glass jar inside to hold water and keep the flowers steady. But then I ran into the photo above and realized that it’s actually an awesome thing to hang a post on. Just about any kind of small, lightweight spooky decoration would look great on this: Ribbons, charms, scraps of lace, novelty buttons, printouts of vintage Halloween cards, fake spider webs, or whatever else catches your fancy. Make sure the material on the boot is clean and dry before decoupaging/gluing anything in place to make sure it’ll stick; if the boot is made of vinyl or something else very slick, you may want to rough up the surface a little with sandpaper to ensure good adhesion. 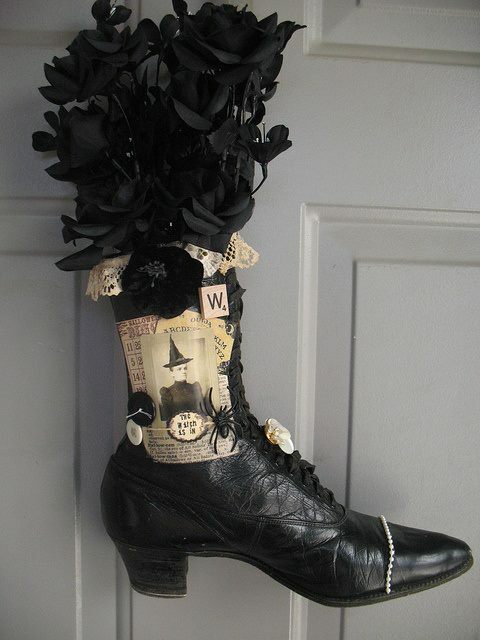 Since scuffs and other signs of wear would simply add to the charm, this would be a fine project for a thrifted boot and would also be a way to salvage a pair of one’s own worn-out shoes. If you don’t like the Victorian “witchy” look, you could go steampunk-with-gears or death-metal-with-spikes too. I quite like the idea of hanging it on the door as a wreath substitute, but it would also look great in a window or simply perched on a table or desk. This is one of those projects where it’s fun to collect little decorative oddments over time, as you find the perfect bits to fill in the spaces. It’s simple, should be fairly inexpensive, and should give you a striking result. *I have a lot of stuff like that in my Drafts folder. Someday I will sweep out the corners and dump the dustpan in your laps. That is amazing!! I would set it on a table so I could put those light up branches in with the fake flowers. :) OR… if the boot was on the small side attach it to a wreath and just decorate the whole thing.